April 12, 2018: The project is continuing on schedule. The sidewalk along Pennsylvania Avenue is now open to pedestrian traffic. Gas and dry utility (phone/data) is complete in the alley final paving activities have commenced. A full-time staffer is on site to assist with coordinating traffic and access in the alley as this work progresses. Final inspections for project completion have commenced and are expected to be complete within the next 30 days. There will continue to be some limited material delivery occurring down the alley that is necessary due to short-term time constraints. March 22, 2018: The project is continuing on schedule. Half of the Pennsylvania Ave sidewalk has been opened and the parking lane returned to public use for vehicles. The green roof work has commenced and is underway through April. Interior work continues with the final drywall installations and finishes. Equipment startup has commenced and commissioning work will continue into April. The gas utility work in the alley is complete. The street lighting and telecom utility work is expected to be complete in April. The alley access will be maintained and updates provided as soon as external contractors (i.e. Pepco, Verizon) provide information. Once the utility work is complete, the alley will undergo resurfacing. March 6, 2018: The project is continuing on schedule. Final landscaping in the Eye Street is ongoing and nearly complete. The sidewalk along Pennsylvania Avenue is complete, and will be open to pedestrian traffic within the next 30 days. Gas and dry utility (phone/data) is continuing in the alley in the next 30 days, and final paving in the alley is scheduled for March/April. Skanska has provided in recent weeks a full‐time individual to assist with coordinating traffic and access in the alley as this work progresses. Final inspections for project completion are expected to commence in the next 45 days. There will continue to be some limited material delivery occurring in the alley. February 7 & 21, 2018: The trash chute has been removed on the South elevation of the building and the remaining window and door openings are being infilled. The roofing membrane and perimeter rails are nearing completion. The Pennsylvania Avenue concrete sidewalk has been poured and pavers are anticipated to be installed later in the month. The interior finishes are well underway and are anticipated to be completed in early spring. The alley utility work that includes street lighting, telecom and natural gas are anticipated to begin in February and continue through the spring. Once the utility work is completed, the alley will be repaved. The alley access will be maintained and updates will be shared regarding external contractors work on utilties. January 22, 2018: There will be some significant work occurring in the alley related to utilities (other than PEPCO) and final paving, etc. in the next 60 days, and Skanska will coordinate that work with the neighbors. The last of the curtain wall façade and overall building envelope is complete. Permanent electrical power is now on in the building with the temporary electrical connection to 2100 now severed, and other utility work will continue to be in the vicinity of the rear of the building and alley for next several months. January 5, 2018: The project is continuing on schedule.The curtain wall is completed along Pennsylvania Ave and the storefront at the ground level is underway. Interior finishes are ongoing. The overhead walkway has been removed and sidewalk improvements are being installed. The Eye St Townhome lot landscaping and the alley lighting work is nearing completion. Pepco’s electrical work is expected to be completed in December. December 18, 2017: The project is continuing on schedule. Final work/landscaping on the Eye Street parcels is ongoing. The last of the curtain wall façade and overall building envelope is nearing completion. PEPCO will continue to be in the vicinity of the rear of the building and alley doing work periodically over the next several weeks. Skanska is no longer planning to shut down the sidewalk in front of the building along Pennsylvania Ave for site work for any extended period of time, and is working to sequence the work with minimal disruption to pedestrian access and traffic. Skanska will share the final coordinated plan once it is finalized and it will be shared here as well. The sidewalk “cover/enclosure” has been removed. November 17, 2017: The project is continuing on schedule. The façade installation on both the front and back of the building is nearly complete. Final landscaping in the Eye Street lot has commenced. PEPCO has nearly completed its work related to electrical service in the alley public space. Gas and dry utility (phone/data) work will commence in the alley in the next 60 days, and final paving in the alley is anticipated for early 2018. The covered pedestrian walkway will be removed in coming weeks.There will continue to be some limited material delivery occurring down the alley that is necessary due to short-term time constraints. October 30, 2017: Work underway includes installation of the curtain wall façade and rear façade as well as final work/landscaping on the Eye Street parcels. PEPCO will continue to be in the vicinity of the rear of the building and alley doing work periodically during Novemeber and any status updates from PEPCO will be shared with neighbors. To accommodate site work, Skanska tentatively plans to close sidewalk adjacent project site along Pennsylvania Avenue in late 2018/early 2019 – more details will be provided in coming weeks. October 13, 2017: The project is continuing on schedule. Final work/landscaping on the Eye Street parcels has effectively commenced with some drainage installation. The curtain wall façade installation is ongoing, as is the installation of the rear façade. To accommodate site work, Skanska tentatively plans to close sidewalk adjacent project site along Pennsylvania Avenue in late 2018/early 2019 – more details will be provided in coming weeks. September 25, 2017: The project is continuing on schedule. Skanska continues coordination with vicinity stakeholders on logistics of the work, alley access, schedule and timing. Final work/landscaping on the Eye Street parcels has commenced with some drainage installation. The curtain wall façade installation is ongoing, as is the installation of the rear façade. Skanska has installed a trash chute on the south/alley facade. PEPCO is in the vicinity doing some related work over the next few weeks. September 5, 2017: The project is continuing on schedule. Façade installation on both the front and back of the building is ongoing. The precast panel installation along the South elevation is complete and the curtain wall along Pennsylvania Avenue has been installed up through level 10. Roofing is currently being installed and the building is expected to be watertight this fall. Interior finishes, elevators and MEP installations continue in the building. Final grading work in the Eye Street lot has commenced, and the final landscaping work will likely commence in coming months. The covered pedestrian walkway is anticipated for removal in October or November. The tower crane was removed the last weekend in August. Aug. 23, 2017: The tower crane for the project will be removed Saturday August 26 and Sunday August 27. Traffic control measures will be put in place on Pennsylvania Avenue where two auxiliary cranes will be positioned to remove the crane. This removal has been shared with internal stakeholders at GW to ensure it will not impact move-in operations during the weekend. Skanska continues work on schedule: Work continues on installation of the curtain wall system, precast panels and MEP rough-ins. Aug 9, 2017: Skanska continues work on schedule: Concrete activities have finished and the curtain wall system is installed to level 8 and precast panels to levels 4 and 11. MEP rough-ins continue upward through the building. A material hoist has been installed on the NW corner of the building (accessed from Pennsylvania Avenue) to accommodate the material deliveries to the site for interior works. The electrical utility rough-in work in the alley is complete with Pepco scheduled to return in the fall of this year to energize the building. The pedestrian walkway along Eye Street has been taken down and the sidewalk is now available to the public. July 12 & 26, 2017: Skanska continues work on schedule. Concrete activities will likely finish this month. MEP rough-ins continue upward through the building along with the framing of core walls and installation of drywall. Installation of glass curtain wall on Pennsylvania Avenue is on floor 3 and will continue upward. Installation of precast panels on the south side of the building will commence in mid-July and require an additional crane in the alley July 17/18. Electrical utility work in the alley is expected to be completed during July. June 29, 2017: Skanska continues work on schedule. Concrete framing is near completion and the building is expected to top out in early July. The exterior facade of the building begins this week with the installation of the curtain wall on the North side of the building along Pennsylvania Avenue later this month. The precast concrete panel installation on the southern exterior is expected to begin this summer. The President Condo façade repair work has completed. June 1 & 15, 2017: Concrete framing activities have reached the 11th floor and the building is expected to top out in coming weeks. The rough-in work continues behind concrete for electrical, plumbing and mechanical. The exterior facade of the building will begin with the installation of the curtain wall on the North side of the building along Pennsylvania Avenue later this month. The precast concrete panel installation is expected to begin this summer. The President Condo façade repair work is progressing. Utility work in the alley is anticipated to begin the week of June 12. Occupants in Rice Hall and other area buildings may experience intermittent periods of medium level noise/vibrations from the equipment. Work will consist of saw cutting and excavating in sections each day, proceeding from Eye Street north to the 2112 Penn Building. Dust should be managed as required and will be closely monitored. Access through the alley will be maintained during this work and updates will be provided if there are any changes. May 3 & 17, 2017: Concrete operations continue to push upward with work now at floor 6 level. Primary activities continue to be framing and stripping of formwork, pouring of columns and slabs, and rough-in work for electrical, plumbing and mechanical. The President Condo façade repair work is progressing. April 3 & 17, 2017: Concrete operations continue to push upward with completion this weekend of Floor 3 deck pour and current framing of Floor 4 deck. Primary activities continue to be framing and stripping of formwork, pouring of columns and slabs, and rough-in work for electrical, plumbing and mechanical. The team will soon install electrical vaults at the southeast corner of the site --- alley access will be maintained, but could be restrictive for brief periods of time and a crane will be set up in the alley for this work. The President Condo façade repair work is progressing with the masonry infill below grade and waterproofing in coming weeks, followed by below grade backfill work and installation of scaffolding. March 10 & 24, 2017: Concrete operations have reach grade and will be working toward topping out this summer. Primary activities continue to be framing and stripping of formwork, pouring of columns and slabs and rough-in work for electrical, plumbing and mechanical. The President Condo façade repair will commence the week of 3/13/17 (weather pending) with masonry infill below grade and waterproofing work that is expected to going into April. Minor masonry repairs to the brick façade above grade and the EIFS installation will then follow in late April / May. February 6, 2017: The below grade concrete work continues and is expected to reach grade later this month. The vertical concrete work is expected to last into the summer. The primary activities over the next couple of months will consist of framing and stripping of formwork, pouring of columns and slabs and rough-in work for electrical, plumbing and mechanical. January 23, 2017: Below grade concrete operations continue with the framing and pouring of the P2 and P1 parking levels. Backfill and waterproofing follow the concrete work around the perimeter of the foundation. The mechanical, electrical and plumbing rough-ins are ongoing activities. January 5, 2017: Below grade concrete operations continue with the framing and pouring of the P2 and P1 parking levels. Backfill and waterproofing follow the concrete work around the perimeter of the foundation. The mechanical, electrical and plumbing rough-ins are ongoing activities. The demolition of the Eye Street townhomes began this week and should finish next week. Following the demolition, minor exterior work to the President Condo will take place for 6-8 weeks for below grade waterproofing, masonry work, and the installation of Exterior Insulation and Finish System (EIFS) where the townhomes previously stood against the President Condo's exterior wall. December 8 & 22, 2016: The foundation work continues with concrete pours for the slab on grade, columns and the elevated parking levels. Additional site activities include Mechanical, Electrical and Plumbing rough-in work along with waterproofing and backfilling of the foundation walls. As previously mentioned, the bulk of site activities through the winter season will consist of installation and removal of formwork and concrete pours. The demolition of the Eye Street townhomes should commence in the near future and an update will be provided at least 1 week prior to this. October 18, November 2 & 16, 2016: Concrete work is underway and will continue through the spring 2017. The demolition of the Eye St Townhomes is expected to occur in coming weeks and an update will be provided when a date is confirmed. October 4, 2016: Excavation activities will be completed in early October. As previously identified, the project will not require controlled rock blasting. Concrete work has begun and is expected to continue through the spring of 2017. The demolition of the Eye St Townhomes is expected to occur later this month. An update will be provided at least 1 week prior to demolition activities commencing. September 21, 2016: Due to the nature of the rock material that has been encountered, controlled rock blasting will not be needed at this project. Concrete trucks have begun arriving on site intermittently, and this activity will increase as the foundation work continues in earnest the next several weeks. The anticipated date for the demolition of the Eye Steet townhomes will be confirmed in the near future. September 1, 2016: Excavation activities continue. Due to the nature of the rock material that has been encountered, controlled rock blasting has not started and material is being removed via mechanical means. Controlled rock blasting (if required) is not expected to begin earlier than the week of September 12. For more information, please see below or this factsheet. The tower crane was installed and is now operational. Concrete work has commenced for the project with framing and pouring of the footings. The anticipated date for the demolition of the Eye Steet townhomes will be confirmed in the near future. August 25, 2016: Excavation activities continue. Due to the nature of the rock material that has been encountered, controlled rock blasting has not started and material is being removed via mechanical means. Controlled rock blasting (if required) is not expected to begin earlier than the week of September 5. For more information, please see below or this factsheet. Footings are being poured so as to accommodate the August 27 date for installation of the tower crane -- Skanska will ensure that two-way traffic is maintained at all times and have flag staff guiding traffic so as to facilitate any move-in arrivals occurring via the northern side of campus. The anticipated date for the demolition of the Eye Steet townhomes will be confirmed in the near future. August 15, 2016: Excavation activities continue into August for 2112 Pennsylvania Ave. Due to the nature of the rock material that has been encountered, controlled rock blasting has not started and material is being removed via mechanical means. Controlled rock blasting (if required) is not expected to begin earlier than the week of August 29. For more information, please see below or this factsheet. Footings are being poured so as to accommodate the tentative August 27 date for installation of the tower crane -- Skanska will ensure that two-way traffic is maintained at all times and have flag staff guiding traffic so as to facilitate any move-in arrivals occurring via the northern side of campus. The anticipated date for the demolition of the Eye Steet townhomes will be confirmed in the near future. August 2, 2016: Excavation activities continue at the project site. The installation of tiebacks is expected to wrap up in the next 2-3 weeks. Footings for the tower crane will be poured later this month with the placing of the crane in late August /early September. Excavation activities continue into August for 2112 Pennsylvania Ave. Due to the nature of the rock material that has been encountered, controlled rock blasting has not started since this material has been able to be removed via mechanical means. Controlled rock blasting (if required) is now expected to begin sometime the week of August 8. For more information, please see below or this factsheet. The anticipated date for the demolition of the Eye Steet townhomes will be confirmed in the near future. July 21, 2016: Excavation activities continue at the project site. The anticipated date for the demolition of the Eye Steet townhomes will be confirmed in the near future, but is anticipated for summer. Controlled blasting is currently anticipated to commence no earlier than the week of August 1 and continue for 6-12 weeks. For more information, please see below or this factsheet. Excavation at the construction site for the new commercial building at 2112 Pennsylvania Avenue, NW (Square 75), has progressed to the point that Skanska (developer, builder and owner of the project under a ground lease with GW) will begin controlled blasting activities on the project this summer. Controlled blasting activities are common in D.C. where rock formations lie near the surface. Once blasting activities begin, they will likely occur once daily on weekdays either between10:30-11:30 a.m. or 1:30-2:30 p.m. for approximately six weeks to three months (pending weather and soil conditions). For many, the air horn signal will be the most noticeable part of this activity and will have a noise impact similar to that of a passing ambulance. The air horn signals are anticipated to be sounded at 15, 5, and 1 minutes prior to the blast, and following the blast to indicate "all clear." The blasting activity itself will result in limited sound and vibration. The sound of the blast can be compared to that of a door slamming or a large truck. The vibrations will last, at most, a few seconds and be noticeable to individuals within close proximity to the site (this will vary depending on a number of factors including weather and where on site the activity is occurring - generally not more than a few blocks). When an air horn sounds, individuals in the vicinity of the project site should follow instructions from site personnel and obey any additional signage that may be posted. Sidewalks adjacent to the site will be closed temporarily during the blasting events, beginning at the five-minute air horn. The 2100-block of Pennsylvania Avenue (between 21st and 22nd streets) and the alley behind it will also be temporarily closed to vehicular traffic for a few minutes during the blasting events with direction from D.C. Metropolitan Police. Exceptions will be made for emergency vehicles. July 1, 2016: Sheeting and shoring, underpinning, installation of tie-backs and excavation activities all continue at project site. The anticipated date for the demolition of the Eye Steet townhomes will be confirmed in the near future, but is anticipated for summer. Controlled blasting is currently anticipated to commence the week of July 11 and continue for 6-12 weeks. For more information, please see below or this factsheet. June 6 & 20, 2016: Soil excavation of the site continues with trucks continuing to remove excavated materials via Pennsylvania Avenue. The anticipated date for the demolition of the Eye Street Townhomes will be confirmed in the near future, but is anticipated for early summer..Controlled blasting activities (which are commin in DC where rock formations lie near the surface) will begin on the project as early as mid-June. Once blasting activities begin, they will likely occur once daily on weekdays either between 10:30-11:30 a.m. or 1:30-2:30 p.m. for approximately six weeks to three months (pending weather and soil conditions). 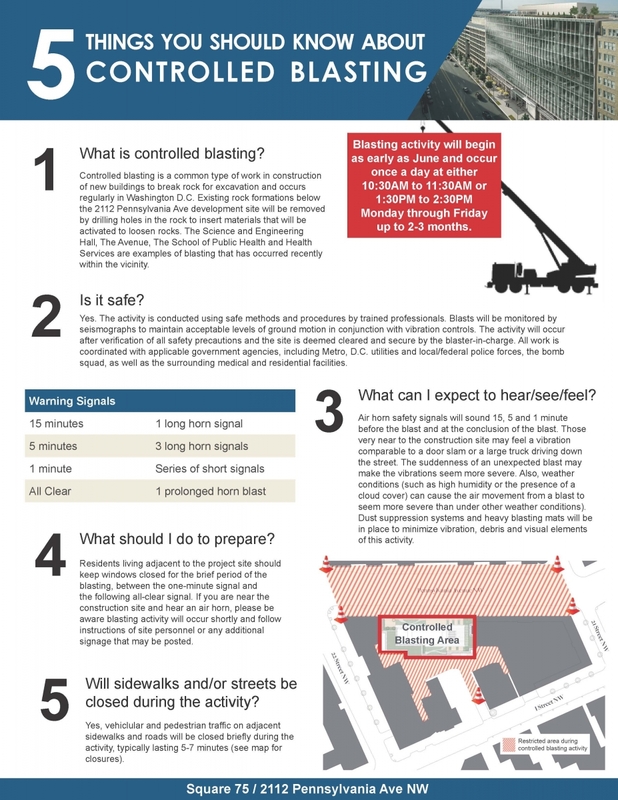 For more information on blasting activities, please see below or download this factsheet. May 3 & 17, 2016: The 2100-W Pennsylvania Ave building has been demolished to grade and the below grade parking structure is currently being removed concurrent with soil excavation on site. Trucks will continue to access the site along Pennsylvania Ave for all excavated materials. Underpinning work along the MFA building continues. The drilling and installation of piles has commenced and will continue through the month of May. The anticipated date for the demolition of the Eye Street Townhomes will be confirmed in the near future, but is anticipated for late spring / early summer. April 6 & 20, 2016: Demolition of the remaining 2100-West Pennsylvania Ave office building will be completed during April. Excavation and below grade demolition activities are set to begin. Other site activities include underpinning work along the MFA building. Demolition of the townhouses at 2129-2133 Eye Street is anticipated later this spring or in early summer. March 22, 2016: Demolition of the remaining 2100-West Pennsylvania Ave office building is ongoing through later in the spring. Selective interior demolition of the townhouses at 2129-2133 Eye Street is complete and full demolition will be scheduled in the coming months. March 8, 2016: Demolition of the remaining 2100-West Pennsylvania Ave office building is ongoing through later in the spring. Selective interior demolition of the townhouses at 2129-2133 Eye Street has begun and is anticipated to last a week followed by full demolition in coming months. February 23, 2016: Demolition of the remaining 2100-West Pennsylvania Ave office building is ongoing through later in the spring. Demolition of the GW Maintenance Building EE (located behind Eye St Townhomes along the alley) is now complete. February 3, 2016: Demolition of the Pennsylvania Avenue rowhouses is complete. The new stair tower to serve 2100-East Pennsylvania Ave has been installed. Demolition of the remaining 2100-West Pennsylvania Ave office building will be ongoing through the following months. Demolition of the GW Maintenance Building EE (located behind Eye St Townhomes along the alley) is expected to complete in mid February. January 20, 2016: Demolition of the Pennsylvania Avenue rowhouses is complete. Demolition of the 2100-West Pennsylvania Ave office building has commenced and is ongoing, and the installation of a new stair tower to serve 2100-East Pennsylvania Ave is nearing completion. Once the 2100-East stair installation is complete in late January, the demolition of the remainder of the 2100-West office building will commence. Demolition of the GW Maintenance Building EE (located behind Eye St Townhomes along the alley) has begun and will continue the following week with minimal disruption to activities in the alley. January 12, 2016: Demolition of the Pennsylvania Avenue rowhouses is complete. Demolition of the 2100-West Pennsylvania Ave office building has commenced and is ongoing, and the installation of a new stair tower to serve 2100-East Pennsylvania Ave is nearing completion. Once the 2100-East stair installation is complete in late January, the demolition of the remainder of the 2100-West office building will commence. Interior demolition of the GW Maintenance Building EE (located behind Eye St Townhomes along the alley) is nearing completion and it is anticipated to be demolished the weekend of January 16, 2016 during which time vehicular and pedestrian traffic in the alley will be limited. Demolition activity will continue the following week with minimal disruption to activities in the alley. January 5, 2016: The installation of the stair pods for 2100-E Pennsylvania Ave Building has commenced and will tie into the existing building in the coming weeks (this work is all occurring from the Pennsylvania Avenue side). Demolition continues for the 2100-W Pennsylvania Ave Building and the remainder of the Pennsylvania Avenue Townhomes. Interior demolition of the GW Maintenance Building EE (located behind Eye St Townhomes along the alley) has begun and the structural demolition is tentatively scheduled for January and more details will be shared once the date has confirmed. On the commencement day for the structural demolition, vehicular and pedestrian traffic in the alley will be limited. December 8, 2015: Site mobilization activities continue. Demolition of the Pennsylvania Avenue townhouses commenced in mid November and will continue in coming weeks as well as selective demolition in 2100-W Pennsylvania Ave building to make way for a new stair tower to serve 2100-E Pennsylvania. Demolition of the maintenance building (Building EE which is between Rice Hall and the President Condos) is anticipated to begin around December 12 and will take roughly 4-6 weeks. During this time, vehicular traffic in the alley will be maintained, but please be aware of the increase in activity during demolition. December 1, 2015: Site mobilization activities continue. Demolition of the Pennsylvania Avenue townhouses commenced in mid November and will continue in coming weeks as well as selective demolition in 2100-W Pennsylvania Ave building to make way for a new stair tower to serve 2100-E Pennsylvania. Demolition of the maintenance building (Building EE which is between Rice Hall and the President Condos) is anticipated for later in December and further timing will be posted when it's available. Square 75/November 13, 2015: Site mobilization activities have commenced with preparatory works throughout the 2100-W Pennsylvania Ave building, the installation of the fencing in the alleyway and the construction of the pedestrian walkway along Pennsylvania Avenue which pedestrians will use for the duration of the project. Demolition of the Pennsylvania Avenue townhouses will commence soon and the 100-W Pennsylvania Ave building will undergo selective demolition to make way for a new stair tower to serve 2100-E Pennsylvania. Demolition of the maintenance building (Building EE which is adjacent to the President Condos) will begin in coming months. Square 75/November 1, 2015: Skanska continues preliminary activity on the site - primarily focused on Pennsylvania Avenue. Construction activity is scheduled to start as early as the week of November 9, 2015, but a specific date is not yet set. Demolition is anticipated to take several months and will vary depending on the size of the structures (from smaller rowhouses to 2100-West Pennsylvania). We will be sharing more detailed information regarding timelines in coming weeks as they are made available. Square 75/July 7, 2015: Utility work related to Square 75 site preparation in the 2100 block of Eye Street (just west of Rice Hall) will begin as early as July 6, 2015 (pending weather) and occur for one to two weeks between 7:00 p.m. to 5:00 a.m., Monday through Friday. The overall noise impact should be low and work is not anticipated to create utility outages, but there will be an increase in truck traffic and general activity on Eye Street. Also, initial excavation of pavement may create intermittent periods of noise. Steel plates will be placed on top of the access holes for the duration of the project; placement and removal of those plates may also cause momentary noise. Although this work will reduce travel space in this section of Eye Street, vehicular and pedestrian passageway will be maintained via on-site staff directing traffic. Square 75/May 6, 2015: Beginning as early as Thursday May 7, 2015 and continuing for approximately four weeks, the curb lane and a portion of the adjacent lane on the south side of the 2100 block of Pennsylvania Avenue (beginning midblock in front of 2100 West Pennsylvania and continuing to the townhouses at 2128-2134 Pennsylvania Avenue) will be closed to accommodate utility work being undertaken in preparation for the upcoming construction at the Square 75A site. This work, to occur Monday-Saturday from 7am-7pm, will require eastbound traffic to merge into one vehicular lane during work hours. While this work is not anticipated to create significant impacts on the morning or evening rush hour commutes, a staffer will be on site during those times to notify traffic via flags as/if needed. Portions of the sidewalks in this space will be narrowed during this time and pedestrians will be advised via signage.